I am happy you were intrigued with Part 1, and that you’ve found your way back! It would seem that a little trickle of knowledge goes a long way when you know there is SO MUCH MORE to be learned about the Animatron Editor. Well then, let us continue our tour of the Editor Workspace, shall we? The Main Menu contains a few helpful goodies that can assist you with your project workflow, so let’s explore. The Main Menu is used to create, edit, test, upload, download and publish your projects. icon located at the top-left of the Workspace. 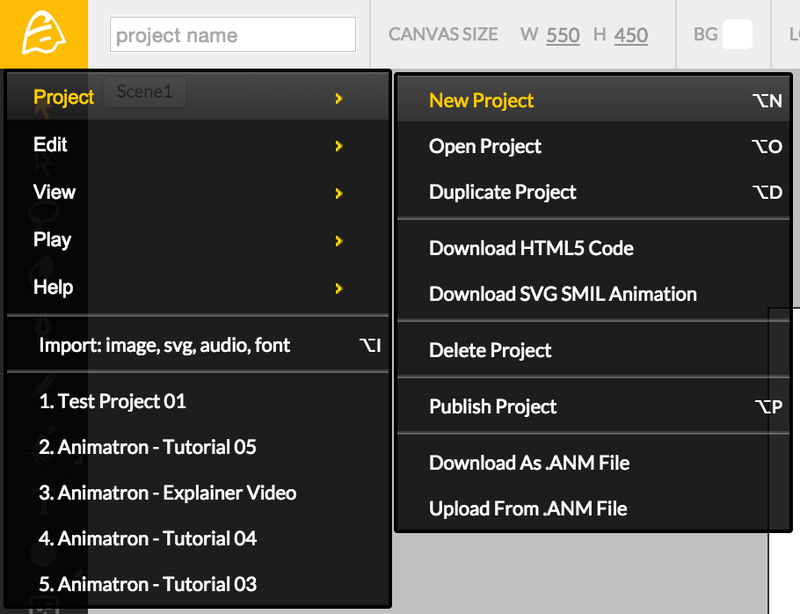 By clicking the Animatron Icon, you should now be able to view the Sub-Menu drop-down list, depicted above. The Main Menu contains a list of project Sub-Menus, an Import Feature and also allows you to view your recently opened projects. The first Sub-Menu, labeled [Project], opens a new drop-down list of project options, shown below. With more than a few Sub-Menu options to choose from, it only makes sense to continue exploring each one further. We invite you to resume the tour with our next look into the Edit and View Sub-menus, in part 3.